Theory: Learning algebraic notation is simple, the name of the piece and the square it moves to - and a few other easy to learn rules including x = takes, + = check, 0-0 castle King side, and so on. The tedium comes in having to "learn" the grid which comes about by noting many games, right? What about learning to "think" and "speak" the grid, keeping the mind focused on the physical space referred to by a grid address, and saving the mental and physical energy required to see the piece, then look off to the side and edge of the board to figure out where it is? Once the grid is learned, writing it down becomes merely an excercise in discipline. Using a small version (fits on 1 8X11 sheet of paper) SANCS mini board helps develop an appreciation for the diagonal geometry of the grid. 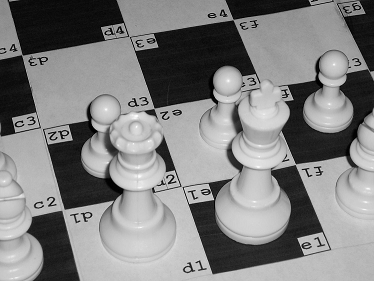 Used in conjuction with a SANCS chess board concentration can then focus on learning the game. 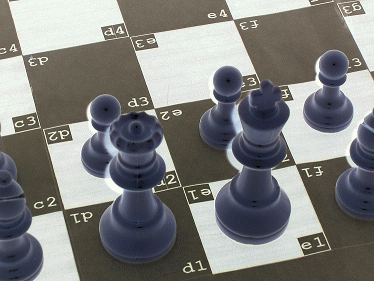 Purchase SANCS chess board(s) with inlaid addresses. Vinyl rollup 20 inch, 2.25 inch squares inlaid with algebraic notation co-ordinate address from both players perspective. actual coloring is black print on white background. Click to view true colors.